Anne Cain began playing competitive golf at 13, and by age 15 was ranked among the top 3 female juniors in the country. An All-American at the University of Georgia, Anne captured several individual titles her senior year, including the Southeastern Conference (SEC) Championship. She ranked #11 nationally and #1 in the Eastern United States. 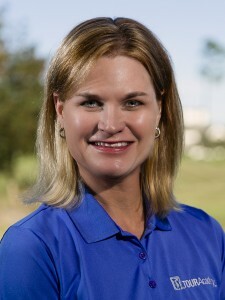 In addition, Anne qualified for the 1989 U.S. Women’s Open as an amateur at age 21. Cain played professionally from 1991-’96 and captured two professional titles before setting her sights on a teaching career. After joining the LPGA Teaching & Club Professional Division in 1995, Anne began a mission to become a world-class instructor. She has personally studied with many of the games’ leading experts and has guided over a dozen Tour players and collegiate competitors, including the NCAA Female Player of the Year and an LPGA major champion. Anne is recognized by GOLF Magazine as one of the Top 100 Teachers in America and is ranked by her peers in the Golf Digest list of Best Teachers in Your State (Florida). In addition, she was the first LPGA instructor to become an authorized instructor of The Golfing Machine. Looking for a golf instruction experience that is tailored to your specific needs and goals? Work with Master Instructor, Anne Cain to design a personalized instruction program just for you. The PGA TOUR Golf Academy custom school experience with Anne offers students the opportunity to build a unique learning schedule focused on developing game fundamentals focused on specific disciplines, or work on their entire game. Train in a one-on-one setting, or learn with a friend and enjoy two-on-one instruction.